DOB: 3/13/1990 Agent: Big League Mgmt. June 2012: Oberg signed with the Rockies, out of the University of Connecticut, via scout Mike Garlatti. Colorado drafted Oberg in the 15th round and signed him for $85,000. In 2012, Scott made the Pioneer League all-star team, leading the league with 13 saves. February 2014: Oberg announced he would marry Diana Filipek, a former UConn rower from New Jersey, later in 2014. In 2014, Baseball America rated Scott as the 13th-best prospect in the Rockies organization. He fell to #23 in the spring of 2015. Aug 14-17, 2018: Scott was on the paternity list. His wife Diana, gave birth to their daughter, Charlotte. Oberg and George Springer, the 2017 World Series Most Valuable Player, were roommates during their first two years at UConn, which included Oberg's arthritis scare, and later were in each other's weddings. "Seeing him physically for the first time and hearing the sound off the bat, I was, 'Wow, I'd never heard anything like this before … this guy is something special,'" Oberg said. Oberg keeps a cane -- one you'd expect a fellow much older than Oberg, 28, to have around -- to remind him where he has been. It's what Oberg had to use just to get out of bed back when he was 20 and was suffering from psoriatic arthritis during his sophomore year at the University of Connecticut. During a six-month ordeal, his toes swelled to look "like little sausages," before he found the right diagnosis and medicine. Oberg said it was difficult getting around campus due to his ailment. Jan 12, 2018: Chris and the Rockies avoided arbitration, agreeing to a one-year deal at $1.3 million. Scott has a 95-99 mph 4-seam FASTBALL that bores in on righthanded hitters and misses the end of lefthanded hitters’ bats. He also has a 94-96 mph 2-seam SINKER Oberg has a very good 12-to-6 power CURVEBALL that is a put-away pitch, and a vastly improved 88-90 mph CHANGEUP. He added his 86-89 mph SLIDER before and during 2015 spring training. By 2019, it was a 60 grade pitch. "Oberg pounds the zone, challenges hitters, doesn’t really walk anybody,” Rockies farm director Jeff Bridich said during 2013 spring training. “He commands the ball low in the zone. He’s got angle on his fastball. He already does a lot of things well that should lead to success. He's got a sense of maturity about him and a calm competitiveness on the mound,” Bridich said. 2016 Season Pitch Usage: 4-seam Fastball: 43.2% of the time; Sinker 16.7% of the time; Change 5.6%; Slider 24.8%; and Curve 9.5% of the time. 2018 Season Pitch Usage: 4-seam Fastball: 48.6% of the time; Sinker 5.9%; Change 6.9%; Slider 38.5%; and Curve less than 1% of the time. Average velocity: 4-seam 96.1 mph, Sinker 94.8, Change 89.4, Slider 87.4, and Curve 76.7 mph. Oberg gets out both left and righthanded hitters with impressive regularity. In 2013, Scott tied a Modesto Oaks franchise record and also had the second most saves in all affiliated minor league baseball with 33 saves. He finished the season with a 1-6 record and a 1.86 ERA, including 61 strikeouts in 53.1 innings pitched. For that he was named among the top prospects in the Rockies’ organization and Baseball America said that he features the best curveball in the system. With a competitive edge and high level of aggression, Scott has a closer's mentality and he has converted 61 of 68 professional save opportunities. as of the start of the 2015 season. The Rockies would have called him up in the 2014 season to help their leaky bullpen, but right shoulder soreness ended his season in August. Scott has worked on a slider, throwing it well in warmups—but not in games. His slider would give him a pitch to open up both sides of the zone, while also providing more of a command breaking pitch, which would allay concerns that his sharp curveball might not be called for strikes in the big leagues. Scott sets up on the extreme first base side of the rubber. "Scott's mechanics, his delivery have become really consistent," manager Bud Black said late in 2018. "You look at the release point, his arm action -- he's repeating it. When you repeat natural arm action, you're going to consistently make pitches." "When Oberg misses, the misses are where they're supposed to be," Black notes. "They're close to the strike zone. He's not missing in big ways. The misses are smaller. When you see a pitcher just missing, that's a really good sign. He's around the plate, he's throwing strikes with the fastball, the slider consistency has improved. You combine the velocity he has and the sharpness to his breaking pitch, you're going to have success." Jan 3, 2019: Rockies right-handed relief pitcher Scott Oberg's work over his past 34 regular-season games -- 1.85 ERA, 40 strikeouts and five walks in 34 innings -- may preview where his career is headed. Later innings, possibly the ninth, could come his way in the future. But at his Sewell, N.J., home, which he shares with his wife, Diana, and a nearly 5-month-old daughter, Charlotte, Oberg keeps a cane -- one you'd expect a fellow much older than Oberg, 28, to have around -- to remind him where he has been. It's what Oberg had to use just to get out of bed back when he was 20 and was suffering from psoriatic arthritis during his sophomore year at the University of Connecticut. During a six-month ordeal, his toes swelled to look "like little sausages," before he found the right diagnosis and medicine. Oberg said it was difficult getting around campus due to his ailment. "It not only affected my feet, but I needed a cane to literally get out of bed and move around my apartment until my joints started loosening to the point I could get my socks on, get my shoes on." He recovered, only to blow out his right elbow and have Tommy John surgery. But here he is, an important part of the Rockies' bullpen. In 2018, Oberg struggled so badly through his first 10 appearances (6.44 ERA) that he was optioned to Triple-A Albuquerque. But after his May 29 return, Oberg became trusted to protect leads. Now, with righty setup man Adam Ottavino exploring free agency this winter and closer Wade Davis signed for two more years, it's possible that Oberg could fill the ninth inning at some point should it become available. So it's a good time to get to know Oberg, a 15th-round Draft pick in 2012 who has overcome much since his arthritis bout to become a key part of the Rockies' present and future.The UConn Huskies produced five Major Leaguers during Oberg's time. The others are Astros outfielder George Springer, D-backs shortstop Nick Ahmed, Red Sox right-hander Matt Barnes and free-agent third baseman Mike Olt. Oberg and Springer, the 2017 World Series Most Valuable Player, were roommates during their first two years at UConn, which included Oberg's arthritis scare, and later were in each other's weddings. "Seeing him physically for the first time and hearing the sound off the bat, I was, 'Wow, I'd never heard anything like this before … this guy is something special,'" Oberg said. They faced off twice in 2015, and Oberg fanned Springer both times. They didn't face each other in the five games between the clubs in 2018. Oberg missed the final two for the birth of his daughter. "I remember somebody asking me, 'Are you nervous about going to the hospital for your blood clots?'" he said. "I'm like, 'No. I've got to get there in one piece and I'll be all right.' I've been around enough doctors to know that these guys know what they're doing." Oberg's performance changed dramatically after the time in Triple-A. According to Statcast™, he saw an increase in the rate of swings and misses on his fastball from April to his performance after his May 29 recall. Also the whiff rate on his slider increased from his first struggling stint to his outstanding run after returning. Most notably, in April the pitches had differing release points. After his May 29 call-up, the red and yellow are more clumped. Translated, batters couldn't tell the difference between the pitches as easily. "I just felt a heightened awareness of my body control, of my pitches, of what it was I was doing out there," Oberg said. Oberg's 2018 ended with a balk, when he dropped the baseball while on the rubber, and a wild pitch to let two runs score in the 6-0 loss to the Brewers that ended a three-game sweep in the National League Division Series. But it's not as if the oddity hangs over his head. "The chances of that [balk] actually happening again are such a small percentage that it's not something where I'm going to beat myself up, try to correct, or hang onto this notion of, 'I'm going to be angry all offseason and take it into Spring Training,'" he said. Scott started the 2019 season with a career record of 12-7 and a 4.31 ERA, having given up 21 home runs and 198 hits in 200 innings. Fall 2010: Oberg had painful psoriatic arthritis in his feet and ankles, making it hard for him to walk. After getting the disease under control with medication, Oberg began preparing for the 2011 season. Facing hitters for the first time in an intrasquad scrimmage, Oberg felt tightness in his elbow. It was a torn ulnar collateral ligament, and Oberg had Tommy John surgery on April 1, 2011. June 13-July 31, 2014: Scott was on the D.L. with a strained shoulder. 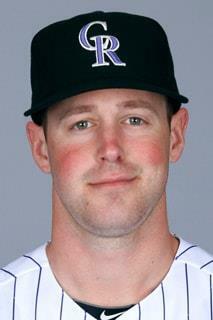 August 10, 2014: Oberg was on the D.L., and then underwent minor shoulder surgery on August 28. August 20-Nov 7, 2016: Oberg was placed on the DL with auxiliary artery thrombosis in his right arm. June 7-27, 2018: Scott was on the DL with back strain.